Bowers & Wilkins' first headphones and desktop speakers break cover | What Hi-Fi? First up are the very stylish P5 premium headphones, aimed at people who want B&W sound quality while on the move. Engineers at B&W's R&D centre have worked "tirelessly to produce a headphone with a natural, unfatiguing performance", the company claims. They've chosen specially developed ultra-linear neodymium magnets and mylar diaphragms to help produce the best sound quality. Many hours of critical listening and tuning went into the P5's development, says B&W. 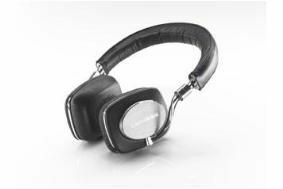 And to eliminate as much external noise as possible, without using full electronic noise cancellation technology, B&W has chosen a closed-back design with a rigid metal face plate and sealed-leather earpads. Apparently the "softest available sheep's leather" has been used for the earpads to give the user maximum comfort. And recognising the popularity of Apple's iPhone and iPod, the P5 comes with a 'Made for iPod' approved cable which allows for speech and device control. users also get a standard audio cable with gold-plated plugs. Also new from B&W are the MM-1 desktop speakers for Macs and PCs. Designed by the same team that developed the B&W Zeppelin iPod dock and 800 Series speakers, the MM-1 is described as "a serious hi-fi speaker". It's a full-range, active, near field monitor with two separate drive units including an aluminium domed tweeter for refined treble performance. New DSP technologies such as B&W's own Dynamic EQ boost bass performance without the need for a separate subwoofer. The MM-1 also has its own headphone output, so audio from a computer passes through the MM-1's DSP before reaching your headphones, providing superior sound to that from a standard Mac or PC headphone socket, says B&W. A pebble remote control comes as part of the package, and can be used to control iTunes and Windows Media Player. The P5 headphones and MM-1 speakers will both be available in January 2010. Prices to be confirmed. Read our exclusive online review of B&W's Zeppelin Mini iPod dock.